Elizabeth Poole is a Queensland artist who lives on the Sunshine Coast. 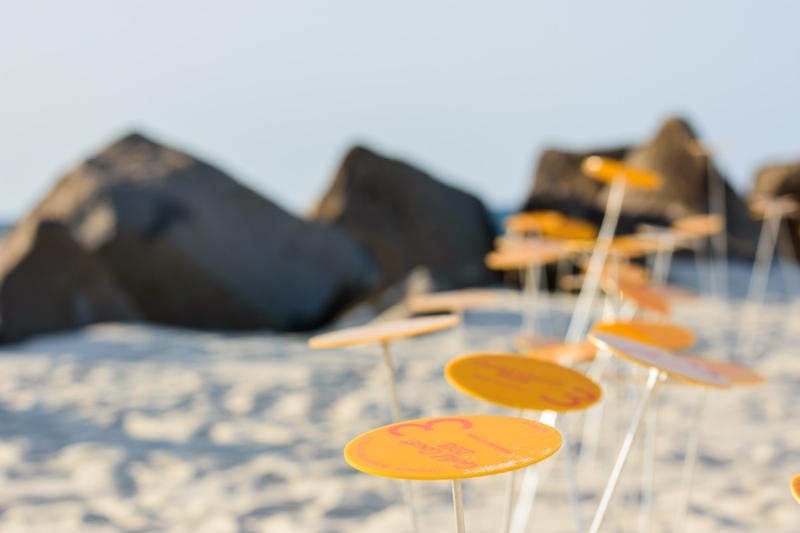 Her work Rebirth: Blooming Yellow Wave / Medals Blooms is a reflection of an earlier installation during the Gold Coast 2018 Commonwealth Games. Writer Nicole Browne spoke with Elizabeth about what inspires her art practice, her connection with nature and how this evolves to create beautiful 3D works that connect to community. “Elizabeth Poole you are in my view, an elder of the Australian arts. An artist and sculptor of immense spirit, history and integrity, you bring your considerable intellect and extraordinary intuition to explore and depict the wonder and beauty of the natural world. We are reminded of so much we take for granted. And… contemplation brings further reward. You utilise this deep appreciation and reverence for life in order to highlight the exploitation of land, animals and the environment. For this reason your works hold a great, simple, inherent beauty and a gentle, clarion call, ‘Be more aware…’. Douglas Winton. It is exciting you have brought the Medal Blooms to SWELL for this year’s festival, especially as only those who had access to the Commonwealth Village had the opportunity to see them set up for the games. How did the idea for the Blooms come about, and how did they find their way to the Commonwealth Village? The original Blooms were first exhibited for SWELL in 2006. I named them ‘The Blooming Yellow Waves', inspired by the wildflowers of our surrounding coastal environment. When Natasha and Ruth were asked to find an artist for the Commonwealth Games Village they were inspired by the Blooming Yellow Wave and gave me a call to see if I would be interested in working with them and adapting the artwork for the games. Over 853 blooms were manufactured, each bloom representing a medal won at the games with the winner's name inscribed on it. There has been some great feedback coming from them. It is always nice to see people getting excited about the commissions. It wasn't a huge population that got to see it at the village so by putting it on the beach for SWELL makes it accessible to a wider audience. What is the most important message you are trying to communicate to your audience, and how do you set the tone of this conversation? I am continually immersing myself in nature, which is where a huge part of my work comes from. I aim to communicate the appreciation, not only of this particular region but of all natural areas. Hopefully, my work encourages a more significant connection with a responsibility to the land and our fellow creatures. As you say my work does speak softly and it endeavours to get people thinking. The pieces look fragile because nature is fragile. This is the sort of message I want to get through. You work with a range of materials. Do the materials inspire the idea… or vice versa? Can you tell us a little about your process? It's like the chicken and the egg, I think. I can't really know what comes first. I may look at something, and it transforms into an idea, that then will lead on to something else. We are always surrounded by influences just by being alive. It can be something someone said, something you had for breakfast, the sun coming up through a spider web. You really don't know where every idea comes from. I love experimenting with different materials and putting them together. Blending soft materials with organic and with industrial, found objects, things like that. Just to see if it will work. Receiving an idea is just the beginning, bringing it to fruition means to craft and develop techniques, then practice that. Sometimes they don't work and they go in the bin. You’re playing with possibilities and working with the material, following what it is telling you. Being the control freak that I am, I really like this way of working, you can't really predict what is going to happen. I find the problem solving process really fascinating. I find composition and harmony the two most important principles of design when it comes to my work. The structure has to be there to build on – the gestalt – and whether it is the relationship of incongruities or of compatibilities, both are to me, essential. To be too harmonious can feel a bit boring and safe, so to kick something out of step can give it energy and more life, I am always experimenting, always learning, in each piece of work. In any art form, it is understanding what to leave out. That is the most important – and difficult. What sort of platform has SWELL given you as an artist over the years? The fact that they really accept my platform of art in nature. A couple of my installations were so much a part of nature that not many people noticed them. There were some nice stick warriors that I covered in copper scale, and then I made them go green with some salt, and I put them under two trees, they blended in so much that not many people saw them! But SWELL accepted that for the mindset, they don't really push the outcome. I could make bigger bolder manufactured pieces, but I am not really interested in that. I would much rather play with the more ephemeral materials and keep it natural. I like the ephemerality because nature is ephemeral. It is always destroying itself and changing, and it blends in. So I guess my work reflects that. Outdoor festivals like SWELL gives me an opportunity to make these environmental statements in a natural environment. You have been a practising artist for a long time now. Can you tell us a little about your background and how your work has evolved over these years? My earliest drawings were from when I was about 4, so I have always been drawing and painting, making things. My formal training was at the National Art School at East Sydney Tech in the years where the teaching of composition in painting was based on Cezanne and Cezannian structure edging towards cubism. Godfrey Miller was one of our teachers, and I became thoroughly entranced with his concept of “A solid permanent understructure to free and fluid things….’ The tenet of a holistic approach to life as well as all forms of art really struck a chord with me. My art has come with me everywhere, through marriage, kids, endless building of houses and moving, I just have to keep doing it. It is a huge part of my life, without it I think I would be in an asylum somewhere. It's interesting, an exhibit I have on at the moment is pretty much a retrospective from about the last 11-12 years. I was interested to see that there is definitely a thread of lines I use and the statements I am making going through my work, even though it has most certainly evolved from when I was a teenager, a student, early stuff, that was mostly painting. I started evolving into 3D about 15 years ago and experimented with sticks and moved on from there. I have no idea what might happen next. What do you feel is your connection to art and community? I am always hopeful that the exhibitions I have will get through to the community. I've given workshops in conjunction with a lot of them, so I hope that, too, helps people understand. Sculpture festivals like SWELL certainly have a larger audience than the galleries because I think people are a bit shy of going to galleries, so participation in these really allows communication to the broader community. Nicole Browne is an emerging writer/journalist from the Gold Coast. 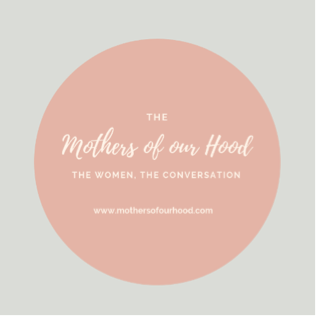 She has founded a community project; The Mothers of our Hood. Here she shares stories told by the mothers of our communities. The project has been created to encourage connectedness, support and communication not only between mothers but throughout the greater community.